Great News! There is a new machine from ResMed. Click the link below to view the newest CPAP Machine. The ResMed S8 Escape™ II CPAP Machine with H4i™ heated humidifier, Easy-Breathe Technology and EPR (Expiratory Pressure Relief) allows for better patient compliance and easier patient exhalation making for a more natural nights sleep. ResMed has set a new industry standard in quiet, reliable, and comfortable sleep therapy. ResMed's integrated H4i™ heated humidification allows for maximum moisture comfort that prevents patients from experiencing dryness and irritation. ResMed's new sophisticated dual motor design delivers superior performance at a lower effort while cutting device noise significantly at only 24 decibels. By reducing pressure during exhalation, the patented EPR Easy-Breathe technology makes the adjustment to CPAP therapy easier and more natural for the CPAP user. ResMed's improved EPR with Easy-Breathe technology offers Expiratory Pressure Relief delivered in a smooth waveform that mimics patient breathing. With a choice of three different EPR comfort levels (1, 2, and 3 cmH2O relief per breath), the S8 Escape™ II with Easy-Breathe technology allows customized comfort for breathing that feels more natural. ResMed's ResScan Data Card allows for remote downloading of patients compliance. The compact design allows for easier traveling and home use. Optional integrated heated humidification can be added to the S8 Escape™ II. 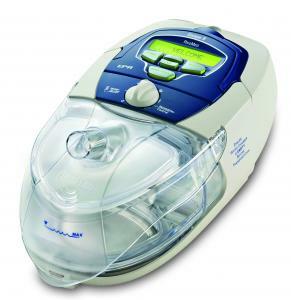 This CPAP machine rates as one of the best CPAP machines on the market today. Pressure ranges can be set between 4 and 20 cmH2O and can be used with any manufactures CPAP mask. This CPAP machine comes with a 6 foot hose, filters, and a convenient carrying bag.